Graham Bruce Richards has been a professional artist since 2004. He has had many successful solo and joint exhibitions throughout Scotland, in: Edinburgh, Dumfries, Helensburgh, Inverness, Kirkcudbright and on the Isle of Mull. His work was also featured and credited in the 2013 movie ‘I Give it a Year’, by the British film studio, Working Title. Graham has made an exciting recent change in direction of his subject to figurative work in the landscape. 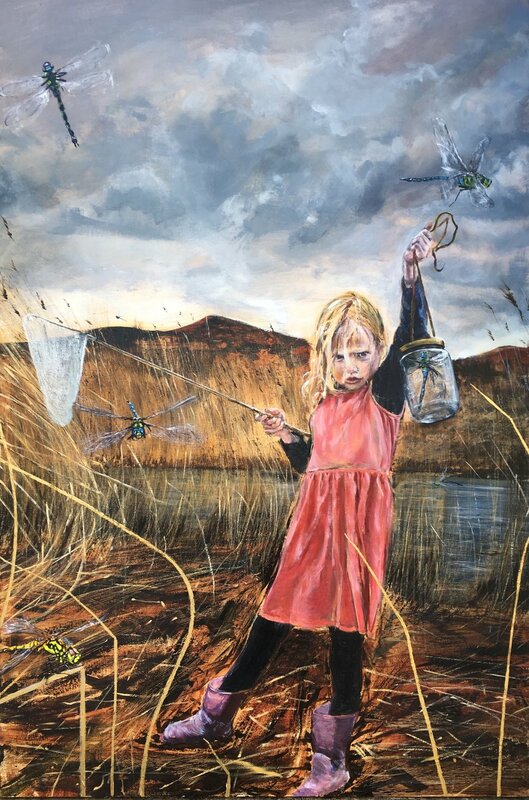 He has already achieved success with this new work, most notably to date his painting “Child’s Play” being exhibited for the 2018 Columbia Threadneedle figurative art prize in London. These paintings have their own recognisable style. In acrylic using a limited colour palette, often with the addition of gold, silver or copper leaf for an added dimension. By using as a setting the backdrop of the Isle of Mull, a Scottish Hebridean Island, they have a surreal sense of place. The rugged natural landscape with its wide untamed spaces, and predominant sepia tones for much of the year, have become key to the narrative in which Graham’s painting’s allow us to contemplate our relationship with the natural world. The works inspire thought into our current and past relationships with nature and the world we have created. We live in a world in which nature is dominated by man yet conversely feel a desire to reconnect with it. This idea is developed further, back to childhood relationships with nature which are formed through lessons learned of its savagery. Through play and exploration, we initially learn to fear the cruelty of nature and from this, ways in which to dominate it. The current switch to computer generated entertainment over outdoor play, brings with it the question as to what these childhood lessons have now become and how they will affect our relationship with the natural world. Di Rollo gallery Dundas street, Edinburgh July - August 2012 solo show. Tollbooth Art centre Kirkcudbright April 2012 solo show. The Rowan Gallery Helensburgh September 2011 mixed exhibition, July 2012 solo show, April 2013 solo show, 2014 mixed exhibition. Glengorm Castle gallery Isle of Mull: May 2009 solo show, August 2010 solo show, August 2011 solo show, August 2012 solo show, August 2013 solo show, 2014 mixed exhibition. Calgary art centre 2009 mixed exhibition, May 2010 solo show, May 2011 solo show, May 2012 solo show, May 2013 solo show, 2014, 2015, 2016, 2017 mixed exhibitions. An TOBAR art centre Tobermory 2011, 2012, 2013, mixed exhibitions. Inchmore gallery Inverness 2012, September 2013 mixed exhibitions. Devorgilla gallery Dumfries solo show 2012, 2013 mixed exhibition. Mall Galleries London January-February 2018, The Columbia Threadneedle figurative art Prize exhibition. Zhou B Haus der Kunst art center Chicago USA 20th April - 8th June 2018. Artwork featured and credited in the 2013 movie ‘I Give it a Year, by the British film studio, Working Title. Artwork Published in Beautiful Kitchens magazine April 2012. Artwork published in Lallans scots language magazine 2013. The Guide Artist August 2017. Poets and Artists, issue 91, Feb 2018 "Visions of Venus" curated by Dr Elaine Melotti Schmidt.